This Article is the third installment in the Hierarchy of Training Series. Before continuing I recommend you check out the first two installments, which you can find HERE & HERE, to get some background info on the previously discussed concepts. 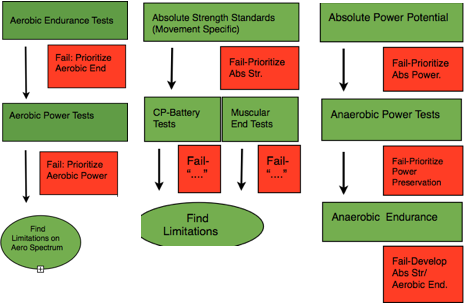 In this article i’m going to discuss the general concepts surrounding athlete assessment/ testing, and how to subsequently structure an athletes program relative to said testing phase, time of year, individual makeup etc. First and foremost, the most important element of testing is to make sure that the battery of tests you present an athlete with are valid. Meaning that the tests actually isolate the characteristic you are trying to get data on. For example, lets take open WOD 13.1 (10 Min AMRAP: PS & DU’s)… One can argue that this is a test of aerobic power, and one may also be right in saying so. However, it can also be a test of muscular endurance, postural stamina, skill under fatigue and so on. In this instance it is pretty easy to see how this is not a valid test of aerobic power, or overall aerobic capacity. But, its not always that cut and dry. I’ve programmed for athletes who have gotten fantastic scores on simple, cyclical, tests of aerobic power such as a 10 minute airdyne for max cals despite the fact that they had poor aerobic development and the successes were solely predicated on a high pain threshold and willingness to suffer greatly. Which is why we not only need a battery of valid tests, but also a large scope of tests that span different extremes to paint a full picture. After establishing validity you must also assure the tests are reliable and applicable. ie) Do top scores on said test correlate with performance in this sport/ is the score spread large enough to extrapolate data. 1) ID Tests- These are used to figure out an athletes individual makeup, relative strengths/ weaknesses, and how they are hard wired. After putting an athlete through ID testing I will know where they fall on the spectrum of powerful to enduring, if they are stronger than fast (or vice versa), how developed their cp-recovery/ aerobic/ anaerobic systems are, and if they need to prioritize absolute strength over muscular endurance (or vice versa). 2) Absolute Tests- Absolute tests are used to determine where an athlete sits relative to their competition for a given characteristic. For example- Whereas an ID test will tell me if an athlete is more enduring than they are powerful an absolute test will tell me how enduring/ powerful they are relative to other athletes. This concept can then be further extrapolated to individual tests and training characteristics. Note- if the absolute tests you’ve designed are valid/ applicable to the sport an athletes results on a given test should tell you how they stack relative to other athletes in the sport for that given characteristic (assuming you have enough data from athletes at different levels). The most difficult part of designing an absolute test is that it must target the same characteristic in all athletes to be valid. For this reason simplicity is king. For example, a 60 Minute Row for max distance is a far superior test of aerobic endurance as compared to 60 minute amrap due to the low muscular endurance/ skill component (ie- minimizing variables as you would in a scientific study). However, there is a time and place for blended tests (as it is the corner stone of the sport). In these instances I recommend combining testing characteristics in as many ways as possible to paint a full picture. Examples include…. Muscular endurance w/ or w/o a respiration component, aerobic power w/ or w/o a muscular endurance component, postural strength under fatigue, etc..
3) Relative Tests- The simplest way to explain relative tests is that the testing characteristic is relative to the athlete taking the test. For example, lets take the following workout…. Depending on the athlete this can be a muscular endurance, aerobic power, or cp recovery based test (ie- it’s relative to the individual). The purpose of these “relative tests” are to determine if an athlete improved upon a given training characteristic. For example- If I determine an athlete need to improve their CP-recovery system in a mixed modal setting I will design a test that I know elicits that response (for them). Then we can objectively determine if they improved upon that training characteristic down the line (ie- if they improve their score on the test we will know it is not due to another factor). Note: The actual process I use for testing a quite a bit more dynamic, but in order to make it comprehensible in written form it’s necessary present it as a static “A+B = C” closed system. While it may seem like the process is based around input/ outputs, in actuality it is based around the “whys”. Ie) Knowing that an athlete needs to improve muscular endurance isn’t what’s important. The key is knowing WHY their muscular endurance is lacking (Do they need to improve localized mitochondrial density, global oxygen consumption, and subsequently their aerobic system…etc). After putting an athlete though the aforementioned types of tests you must figure out how to prioritize the elements they need to improve. An easy, albeit oversimplified, way to conceptualize this is to use the hierarchy depicted in part one of the series. In this instance you can determine where an athlete sits on the hierarchy and subsequently prioritize their training in terms of where they lie relative to it. Another way to utilize the hierarchy is to reformat your “absolute testing phase” in a hierarchical manner (as seen in the concept map below). Performance is built on a foundation of mental and hormonal health (though health and performance can be diametrically opposed at times). Which is why it is critical that these systems are optimized to the best of our abilities. 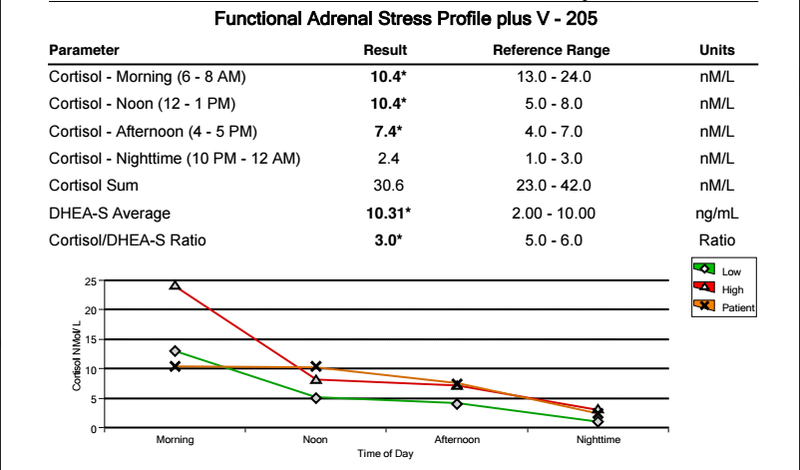 As it currently stands the most efficient way to asses an athletes hormonal state is through the use of an ASI (adrenal stress index) which will give data on an athletes DHEA, cortisol, testosterone, estriol, estradiol, progesterone, and melatonin levels. As with physical assessment figuring out WHY things are the way they are here will be critical to restoring an optimal state. When laying out the framework for a program we need to take the following into account…. 1) Strengths/ Limitations —> to determine priorities. 2) Individual Makeup —> to determine what methods will be effective. *Again, this is oversimplifying a dynamic, fluid, concept model. The following mini case study is with an athlete i’ve worked with for ~9 months. Since I already have extensive data on this athlete the scope of testing sampled below is limited to absolute/ relative tests performed over the course of the past month as part of an offseason assessment. Based on the results of this testing phase, as well as previous assessments, i’ve determined that this athletes training priorities going forward are…. Based on the aforementioned training priorities, time of year (offseason), and athlete ID I wrote the following training split (M/Tu/W/Fr/Sa), which will be used for the next eight weeks before reassessing progress and adjusting the split moving forward. This entry was posted in Uncategorized by evanpeikon. Bookmark the permalink. Hey Evan-I like your simple drop down chart regarding testing and if “fail, focus here”. Very simple to understand and apply. But, what standards are you going off of for a pass or fail? Thanks! I have ranges of scores on various tests (correlating to games/ regional/ top open/ middle to low end open performances) for each testing characteristic. So relative to an athletes goal/ current standing I will rank them on absolute tests to determine if they are up to par for a given testing characteristic (whilst considering their ID testing as well). To give you an example of what this may look like…. I will then chart their scores and rank them relative to all athletes, which will give me an idea of where they stand on a grand scale. If they are getting middle of the pack open scores it indicates a gapping weakness that needs to be addressed in order to further develop them. On the other hand if they are getting top level open scores and their ID tests are such that we need to capitalize on other elements to further develop them we may not need to prioritize aerobic endurance as much. Does this make sense? If you’d like to go further into detail on scores, ranks, and tests for each characteristic that Is something we can discuss in a coaching consult as it’s a fairly deep subject.